Pies | Does This Font Make Me Look Fat? My mother was an incredible pie baker. Growing up on an Iowa farm with a father known as Apple Johnson and renowned for his orchards, most of her pies were of the fruit variety. Apple, peach, plum, gooseberry, strawberry rhubarb, and sour cherry. She always made her own crust and one of her cookbooks has notations next to a crust recipe for how to double, triple and quadruple the mixture. Whenever I bake my mother is in the kitchen with me. She taught me how to make pie crust and roll it out like a pro. By the time I was eight I could make a credible pie from scratch. I remember her holding my hands, showing me how to make the fluted edging on the crust. 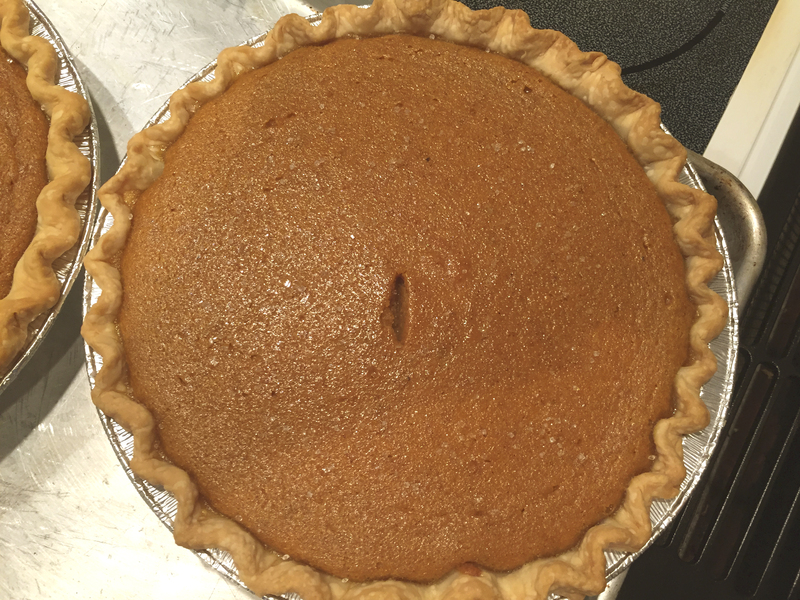 Today I was baking pumpkin pies for the St. Michaels Community Center. Tomorrow is their pumpkin carving contest and pie baking contest. I was just making pies to donate as many are sold by the slice, but they came out so pretty, I think I might enter one of them. Did I make my own crust? I confess I don’t often do that anymore. In fact, I don’t bake a lot anymore. My husband is gluten intolerant and having yummy baked goods in the house is not beneficial to our waistlines or his health. This time I saved out a little of the filling and baked it without a crust for us. These pies were made with Pillsbury already rolled out crust from the grocery store. I put two packages of crust in the freezer for the two apple pies I’ll make for the Thanksgiving table.. The filling is from a recipe from my friend Cathy Mendenhall. She actually won the Community Center pie contest one year with this recipe and has shared it with many friends. My mother’s pumpkin pies used the recipe on the label of Libby’s pumpkin. This is better – sorry, Mom. The half stick of butter and heavy cream certainly contribute to the fantastic result. Combine sugar, flour, salt, nutmeg, cinnamon, and pumpkin pie spice. Stir well. Insert a knife in center to test for doneness. When it comes out clean the pie is done. Serve plain or topped with whipped cream.